The first thing that popped into my head when I read the synopsis of this book is: Oh man. This reminds me of the movie I am Legend. Yes, that movie starring Will Smith in which the cure for cancer was found, but turned out to be some virus that turned everyone into zombies. Boy, was that a scary movie. And I saw it in iMax, too. IMAX. *Shudders*. 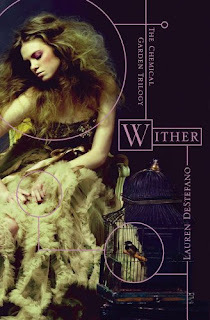 Alas, Wither by Lauren DeStefano has nothing to do with zombies, but it DOES have something to do with curing cancer… and any almost every other ailment to ever negatively affect a human being. I’m definitely glad I picked it up, because it is a very intriguing story, very intriguing indeed. But Rhine has more to contend with than losing her freedom. Linden's eccentric father is bent on finding an antidote to the genetic virus that is getting closer to taking his son, even if it means collecting corpses in order to test his experiments. With the help of Gabriel, a servant Rhine is growing dangerously attracted to, Rhine attempts to break free in the limited time she has left. More info about this book can be found here. If you didn’t really understand my cure-for-cancer-turns-people-into-zombies analogy, let me clarify; basically, science created a “perfect” generation of children who have crazy high immune systems and they never see a sick day in their life, aging gracefully. Same goes for their children… at least, until the males reach the age of 25 and females, 20. Then they die. Right on their birthday. You see the analogy now? So, the main character, Rhine, is one of these children who will die on her 20th birthday. Kidnapped from her home and taken from her twin brother, Rowan, Rhine and two other girls are chosen to be sister wives, bound to wealthy young (and kind of cute) Linden Ashby so that they can “replenish” Earth’s dwindling human population. Rhine, more than anything, just wants to escape her much-hated new life of wealth, but there are some complications. Linden’s scary father, Housemaster Vaughan, hides behind the fact that he’s finding a cure for the genetic virus, but is that what he’s REALLY doing in that creepy, sterile basement of his? (Trust me, I don’t think I’ve ever been so scared of a character before. Even President Snow in The Hunger Games trilogy isn’t THAT scary). He’s also hell-bent in making sure none of his son’s wives escape, making Rhine’s plan almost impossible. Then there’s Gabriel. Two words: he’s HOT. And Rhine (expectedly) is falling for him instead of her husband. But Gabriel is just a servant, making their love for each other deliciously forbidden, and now Rhine can’t leave Gabriel behind in her escape. Then, there’s Jenna and Cecily, her fellow sister wives, possibly the only ones who truly understand Rhine’s hatred and desire to escape. Can she abandon them too?